An original 1962 railway carriage, standing in its own grounds and garden alongside the old station platform; now carefully converted and refurbished to offer well equipped self-catering holiday accommodation. It offers a lounge/diner, kitchen, bathroom, double bedroom, twin bedroom and a bunk room for two. Self-catering holiday cottages at Kirkby Stephen Station right on the on the famous Settle/Carlisle line. Platform Cottage, at the north end of the station, has a twin and a double and sleeps up to four guests. Booking Office Cottage also has 2 bedrooms, (one twin and one double), a bathroom, kitchen and lounge (former booking office), complete with ticket hatch. Luxurious replica Great Western brake van, in a rural spot, next to railway tracks on the West Somerset Steam Railway. This holiday property comes with views over historic steam locomotives and carriages – ideal for any train lover! The van has a country-style interior with historic train-related features. It has an open-plan living/dining area, modern kitchen, hot tub, veranda, sumptuous master bedroom, cosy twin and a modern bathroom. A choice from two converted railway carriages at Brockford Railway Sidings, on the site of the Mid-Suffolk Light Railway, with the Railway Museum close by. Use of shared pool, hot tub and garden, surrounded by countryside and quiet lanes, this property is ideal for cycling and walking breaks. A choice from three self-catering properties available to hire, two converted carriages and one station cottage. Each carriage sleeps up to six and the cottage sleeps four. They overlook the line and self-catering guests also get free travel on the railway! A delightful beach-front villa built around two carefully restored C19th Studley railway carriages. A fresh cream and blue interior gives this holiday home a distinct seaside feel. The property can sleep up to eight in two double bedrooms, a twin bedroom with bunks and a twin with bunk and cot or bed. Formerly a signal box on the Eden Valley Railway line this quirky, upside-down, luxury holiday cottage nestles at the bottom of Whinfell Forest, between Appleby and Penrith. It offers one double bedroom, but can also sleep two more on a comfortable lounge sofa bed/futon. A lovingly converted former railway signal box, right next to the original station on the well known Primrose Line. Signal Box Cottage retains its links with the railway, using many of the original features and signage, but the interior offers a fresh modern rental with up-to-date conveniences. Modern self-catering holiday cottage converted from a former signal box on the Mortehoe & Woolacombe Railway. The holiday cottage is on the outskirts of the picturesque resort of Woolacombe. 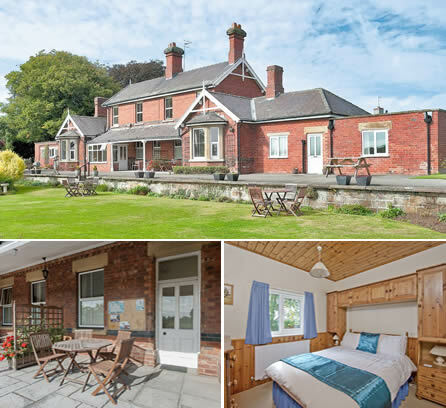 A choice of 4 self-catering holiday apartments, converted from a former station house, on the Scarborough to Pickering Line. They are close to the North York Moors National Park and the Heritage coastline. The North Yorks Moors Steam Railway 8 miles away at Pickering is an added attraction for train enthusiasts. A converted station building on the site of the Mid-Suffolk Light Railway, (also see two converted railway carriages above). The accommodation offers a living/dining room, kitchen, two bedroom bathroom with galleried twin bedroom on the first floor. The property also has wheelchair access. Ideal for larger groups; if all apartments are booked together this former station building will house up to 12 people, or can be booked individually as 4 or 2 person rentals. The apartments have been converted from the old station buildings on the Scarborough to Pickering Line and retains the station platform as a delightful patio area. The Station House Allerston is in a prime holiday location, close to the North York Moors National Park and the Heritage coastline. The North Yorks Moors Steam Railway is just eight miles away at Pickering and makes an added attraction for train enthuiasts. A tastefully conversion of a 1957 railway carriage, with lovely countryside views, near Castle Douglas, Kirkcudbright and Gatehouse of Flee – sited at a quiet spot on a former siding of the old Bridge of Dee station. The accommodation is all on one level and is made up of an open-plan living room/kitchen, 3 bedrooms (2 en-suite doubles and a children's bunk room). It has gas central heating, all linen included, freeview TV, DVD, CD, iPod dock, washing machine, fridge/freezer, WiFi, large lawned garden, barbecue, parking and cycle store. The location offers scenic coastal and forest walks, sailing, swimming, riding, fishing, golf, boat trips and watersports. The Solway Coast has sandy beaches and rocky coves, with fishing villages and harbours. Holiday homes in converted railway carriages are gaining in popularity, attracting train lovers of course, particularly when they're on a working rail line or heritage railway, but also for anyone seeking something a bit different, quirky or with a sense of history. At Travel-Quest, we're happy to list all types of railway and train related holiday accommodation, but we do have a particular penchant for converted carriages; our article takes a look at this singular type of holiday home conversion and also look at the history of its forerunner, the Camping Coach. Add to the experience of staying in railway accommodation by travelling there on the sleeper train. It's the idea of going to sleep in one city and waking in another that appeals to many travellers and train enthuiasts, even if, these days, it's in the rather prosaic surroundings of a modern sleeper train berth. An overnight trip on the sleeper is an experience to be dicscoverd at least once in your lifetime. The UK still runs two sleeper services, both departing from London. The most well know is probably the Caledonian Sleeper service to Scotland, which offers two routes – a Highland route between London Euston and Fort William, Inverness, and Aberdeen; and a Lowland route which connects London Euston to Glasgow Central or Edinburgh Waverley. The other main service, the GWR Night Riviera Sleeper goes the other way and connects London Paddington to Penzance, in Cornwall. This service is in the process of an update and is offering new cabins (see photo), lounges and fabulous new menus. From either of these sleeper services fuurther train travel will be needed to connect up with any of the railway accommodation listed here, but that's usually no hardship for dedicaded train lovers! This is a follow-on page in the Travel-Quest railway and train accommodation section, please go to the opening page for the full category definition. Unless credited otherwise, any photos used on this page are copyright of the Travel-Quest Directory or of the companies listed. See our Photography Policy for more details (including any credits for photo collages). Any other specific credits for this page now follow. Links to any Licences are on our Photography Policy page. The symbol indicates an affiliate partner, Travel-Quest may earn a fee from these. Any such fees are used in the running of the site, full details are available here.